Point clouds produced with dense-matching by photogrammetry software such as SURE, Pix4D, or Photoscan can include a fair amount of the kind of “low noise” as seen below. Low noise causes trouble when attempting to construct a Digital Terrain Model (DTM) from the points as common algorithm for classifying points into ground and non-ground points – such as lasground – tend to “latch onto” those low points, thereby producing a poor representation of the terrain. This blog post describes one possible LAStools workflow for eliminating excessive low noise. It was developed after a question in the LAStools user forum by LASmoons holder Muriel Lavy who was able to share her noisy data with us. See this, this, this, this, this, and this blog post for further reading on this topic. Lots of low noise in tile ‘panca_388500_4963000.laz’. Cross section of noisy area of tile ‘panca_388500_4963000.laz’. Lots of very low noise in tile ‘panca_388500_4963000.laz’. Cross section of very noisy area of tile ‘panca_388500_4963000.laz’. We leave the usual inspection of the content with lasinfo, lasview, and lasvalidate that we always recommend on newly obtained data as an exercise to the reader. Note that a check for proper alignment of flightlines with lasoverlap that we consider mandatory for LiDAR data is not applicable for dense-matching points. Highest point per 2.5 by 2.5 meter grid cell classified as 8. Marking isolated points as noise with classification 7 (pink). Point surviving thinning and noise removal are input for temporary ground classification. Temporary ground points used for low noise removal. All raw points falling 0.5 meter under TIN of temporary ground points become low noise (pink). Points that are not low noise are used as input for final ground classification. Triangulation of final ground points. Then we create a seamless hill-shaded DTM tiles by triangulating all the points classified as ground into a temporary TIN (including those in the 25 meter buffer) and then rasterizing only the inner 500 meter by 500 meter of each tile with option ‘-use_tile_bb’ of las2dem. For more details on the importance of buffers in tile-based processing see this blog post here. The biggest problem of generating a Digital Terrain Model (DTM) from the photogrammetric point clouds that are produced from aerial imagery with dense-matching software such as SURE, Pix4D, or Photoscan is dense vegetation: when plants completely cover the terrain not a single point is generated on the ground. This is different for LiDAR point clouds as the laser can even penetrate dense multi-level tropical forests. The complete lack of ground points in larger vegetated areas such as closed forests or dense plantations means that the many processing workflows for vegetation analysis that have been developed for LiDAR cannot be used for photogrammetric point clouds … unless … well unless we are getting those missing ground points some other way. In the following we see how to integrate external ground points to generate a reasonable DTM under a dense forest with LAStools. See this, this, this, this, and this article for further reading. Hillshading of dense matching points created with las2dem. Location of manual ground control points (red) created with lasgrid. Attempts to ground-classify the dense matching point cloud directly are futile as there are no ground points under the canopy in the heavily forested area. Therefore 558 ground points were manually surveyed in the forest of interest that are around 50 to 120 meters apart from another. We show how to integrate these points into the dense matching point cloud such that we can successfully extract bare-earth information from the data. In the first step we “densify” the manually collected ground points by interpolating them with triangles onto a raster of 2 meter resolution that we store as LAZ points with las2dem. You could consider other interpolation schemes to “densify” the ground points, here we use simple linear interpolation to prove the concept. Due to the varying distance between the manually surveyed ground points we allow interpolating triangles with edge lengths of up to 125 meters. These triangles then also cover narrow open areas next to the forest, so we clip the interpolated ground points against the forest stand delineating polygon with lasclip to classify those points that are really in the forest as “key points” (class 8) and all others as “noise” (class 7). Below we show the resulting densified ground points colored by elevation that survive the clipping against the forest stand delineating polygon and were classified as “key points” (class 8). The interpolated ground points in narrow open areas next to the forest that fall outside this polygon were classified as “noise” (class 7) and are shown in violet. They will be dropped in the next step. We then merge the dense matching points with the densified manual ground points (while dropping all the violet points marked as noise) as input to lasthin and reclassify the lowest point per 1 meter by 1 meter with a temporary code (here we use class 9 that usually refers to “water”). Only the subset of lowest points that receives the temporary classification code 9 will be used for ground classification later. 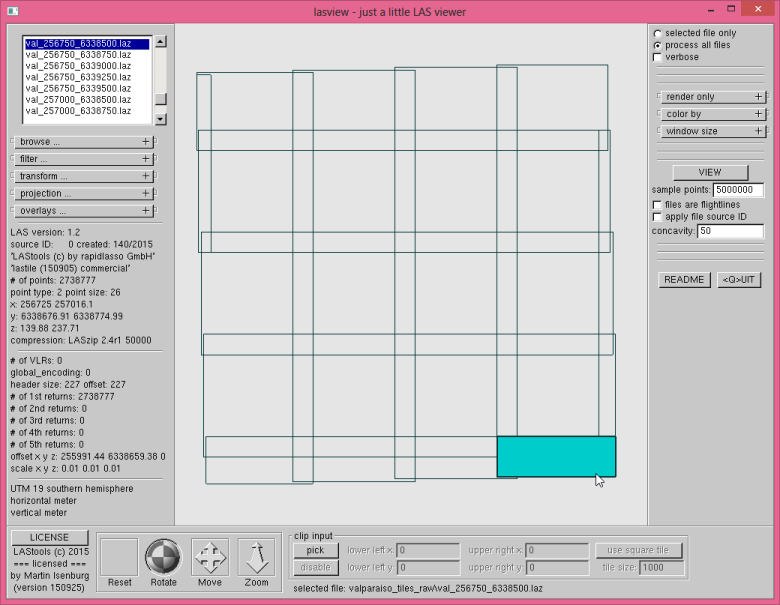 We use the GUI of lasview to pick several interesting areas for visual inspection. The selected points load much faster when the LAZ file is spatially indexed and therefore we first run lasindex. For better orientation we also load the forest stand delineating polygon as an overlay into the GUI. We pick the area shown below that contains the target forest with manually collected and densified ground points and a forested area with only dense matching points. The difference could not be more drastic as the visualizations show. We overlay the polygon for orientation and sample 10 million points in the selected area. The wireframe view of triangulating the lowest point in each square meter (class 9). The densified ground points are clearly visible as a grid under the canopy in the target forest. Other forested areas do not have their lowest points anywhere near the ground. Now we run ground classification using lasground with option ‘-town’ using only the points with the temporary code 9 by ignoring all other classifications 0 and 8 in the file. We leave the temporary classification code 9 unchanged for all the points that were not classified with “ground” code 2 so we can visualize later which ones those are. We again use the GUI of lasview to pick several interesting areas after running lasindex and again load the forest stand delineating polygon as an overlay into the GUI. We pick the area shown below that contains all three scenarios: the target forest with manually collected and densified ground points, an open area with only dense matching points, and a forested area with only dense matching points. The result is as expected: in the target forest the manually collected ground points are used as ground and in the open area the dense-matching points are used as ground. But there is no useful ground in the other forested area. The overlayed polygon in the GUI helps us pick an interesting area. Ground points triangulated into a shaded TIN with a strip of all points rendered on top. Wireframe view and a strip of only ground points clearly shows the difference. Now we can compute the heights of the points above ground for our target forest with lasheight and either replace the z elevations in the file of store them separately as “extra bytes”. Then we can compute, for example, a Canopy Height Model (CHM) that color codes the height of the vegetation above the ground with lasgrid. Of course this will only be correct in the target forest where we have “good” ground but not in the other forested areas. 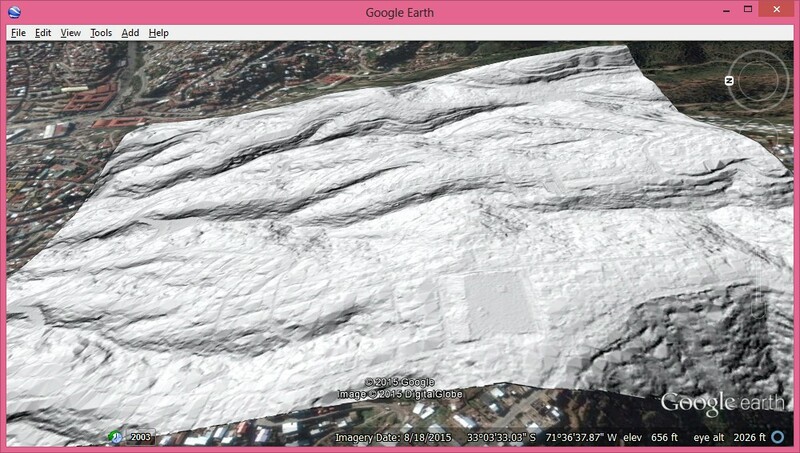 We also compute a hillshaded DTM to be able to visually inspect the topography of the generated terrain model. 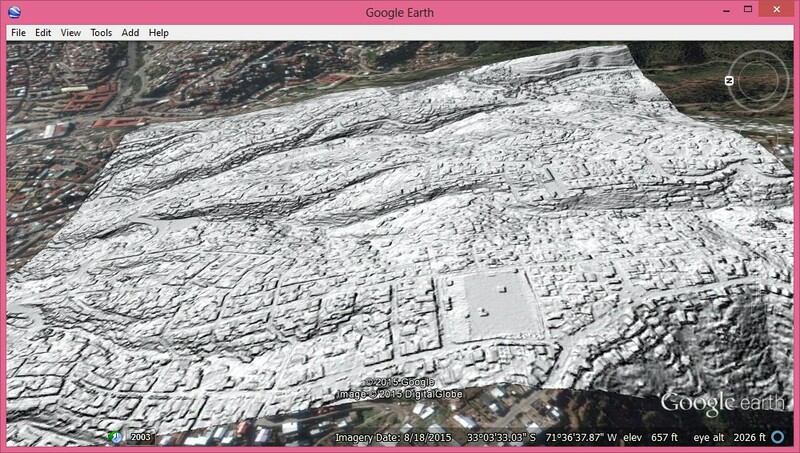 Here you can download the resulting color-coded CHM and the resulting hill-shaded DTM as Google Earth KMZ overlays. Clearly the resulting CHM is only meaningful in the target forest where we used the manually collected ground points to create a reasonable DTM. In the other forested areas the ground is only correct near the forest edges and gets worse with increasing distance from open areas. The resulting DTM exhibits some interesting looking bumps in the middle of areas with manually collected ground point. Those are a result of using the dense-matching points as ground whenever their elevation is lower than that of the manually collected points (which is decided in the lasthin step). Whether those bumps represent true elevations of are artifacts of low erroneous elevation from dense-matching remains to be investigated. The CHM color-codes vegetation height from blue (0 meter) to red (25 meter or higher) of the target forest. The DTM in surrounding forested areas is not true ground which falsifies their heights in the CHM. At INTERGEO 2016 in Hamburg, the guys from Aerowest GmbH shared with us a small photogrammetric point cloud from the city of Soest that had been generated with the SURE dense-matching software from nFrames. We want to test whether – using LAStools – we can generate a decent DTM from these points that are essentially a gridded DSM. If this interest you also see this, this, this, and this story. Here you can download the four original tiles (tile1, tile2, tile3, tile4) that we are using in these experiments. We first re-tile them into smaller 100 meter by 100 meter tiles with a 20 meter buffer using lastile. We use option ‘-flag_as_withheld’ that flags all the points falling into the buffer using the withheld flag so they can easily be removed on-the-fly later with the ‘-drop_withheld’ filter (see the README for more on this). We also add the missing projection with ‘-epsg 32632’. Below is a screenshot from one of the resulting 100 meter by 100 meter tiles (with 20 meter buffer) that we will be focusing on in the following experiments. The tile ‘soest_437900_5713800.laz’ used in all experiments. Next we use lassort to reorder the points ordered along a coherent space-filling curve as the existing scan-line order has the potential to cause our triangulation engine to slow down. We do this on 4 cores. We then use lasthin to lower the number of points that we consider as ground points (see the README for more info on this tool). We do this because the original 5 cm spacing of the dense matching points is a bit excessive for generating a DTM with a resolution of, for example, 50 cm. Instead we only use the lowest point in each 20 cm by 20 cm cell as a candidate for becoming a ground point, which reduces the number of considered points by a factor of 16. We achieve this by classifying these lowest point to a unique classification code (here: 9) and later tell lasground to ignore all other classifications. Then we run lasground on 4 cores to classify the ground points with options ‘-step 20’, ‘-bulge 0.5’, ‘-spike 0.5’ and ‘-fine’ that we selected after two trials on a single tile. There are several other options in lasground to play with that may achieve better results on other data sets (see README file for more on this). The ‘-ignore_class 0’ option instructs lasground to ignore all points that are not classified so that only those points that lasthin was classifying as 9 in the previous step are considered. However, when we scrutinize the resulting ground classification notice that there are bumps in the corresponding ground TIN that seem to correspond to areas where the original imagery has dark shadows that in turn seem to significantly affect the geometric accuracy of the points generated by the dense-matching algorithm. Looking a the bump from below we identify the RGB colors of the points have that form the bump that seem to be of much lower accuracy than the rest. This is an effect that we have noticed in the past for data generated with other dense-matching software and maybe an approach similar to the one we take here could also help with this low noise. It seems that points that are generated from shadowed areas in the input images can have a lot lower accuracy than those from well-lit areas. We use this correlation between RGB color and geometric accuracy to simply exclude all points whose RGB colors indicate that they might be from shadow areas from becoming ground points. The RGB colors of low-accuracy points are mostly from very dark shadowed areas. We use las2las with the relatively new ‘-filtered_transform’ option to reclassify all points whose RGB color is close to zero to yet classification code 7 (see README file for more on this). We do this for all points whose red value is between 0 and 30, whose green value is between 0 and 35, and whose blue value is between 0 and 40. Because the RGB values were stored with 16 bits in these files we have to multiply these values with 256 when applying the filter. Below you see all points that will no longer be considered because their classification was set to 7 by the command above. Points whose RGB values indicate they might lie in the shadows. We then re-run lasground with the same options ‘-step 20’, ‘-bulge 0.5’, ‘-spike 0.5’ and ‘-fine’ as before but now we ignore all points that are still have classification 0 because they were not classified as 9 by lasthin earlier and we also ignore all points that have been assigned classification 7 by las2las in the previous step. The situation has significantly improved for the bumb we saw before as you can see in the images below. The bump is pretty much gone. And much fewer points in the shade are used. Finally we create a DTM with blast2dem (see README) and a DSM with lasgrid (see README) by merging all points into one file but dropping the buffer points that were marked as withheld by the initial run of lastile (see README). As our venerable lasview (see README) can directly read BIL rasters as points (just like all the other LAStools), so we can compare the DTM and the DTM by loading them as two flight lines (‘-faf’) and then switch back and forth between the two by pressing ‘0’ and ‘1’ in the viewer. Above you see the final DTM and the original DSM. So yes, LAStools can definitely create a DTM from point clouds that are the result of dense-matching photogrammetry. We used the correlation between shadowed areas in the source image and geometric errors to remove those points from consideration for ground points that are likely to be too low and result in bumps. For dense-matching algorithms that also output an uncertainty value for each point there is the potential for even better results as our range of eliminated RGB colors may not cover all geometrically uncertain points while at the same time may be too conservative and also remove correct ground points. At PhoWo and INTERGEO 2015 rapidlasso was spending quality time with VisionMap who make the A3 Edge camera that provides fine resolution images from high altitudes and can quickly cover large areas. Under the hood of their LightSpeed software is the SURE dense-matching algorithm from nframes that turns images into photogrammetric point clouds. We were asked whether LAStools is able to create bare-earth DTM rasters from such points. If you have read our first, second, or third blog post on the topic you know that our asnwer was a resounding “YES!”. But we ran into an issue due to the large amount of low noise. Maybe the narrow angle between images at a high flying altitude affects the semi-global matching (SGM) algorithm. Either way, in the following we show how we use lascanopy and lasheight to mark low points as noise in a preprocessing step. Then we tiled the 100 million points into 250 meter by 250 meter tiles with 25 meter buffer using lastile. We use the new option ‘-flag_as_withheld’ to mark all buffer points with the withheld flag so they can be easily removed on-the-fly via the ‘-drop_withheld’ command-line filter (also see the README file). By pressing the hot keys <0>, <1>, <2> and <3> to switch between the different percentiles and <t> to triangulate them into a surface, we can see that for this example the 10th percentile works well while the 5th percentile is still affected by the low noise. Hence we use the 10th percentile elevation surface and classify all points below it as noise with lasheight (also see the README file). We visually confirm that all low points where classified as noise (violett). Note the obvious “edge artifact” along the front boundary of the tile. This is why we always recommend to use a buffer in tile-based processing. Above you see the generated DTM and the corresponding DSM. So yes, LAStools can create DTMs from points that are result of dense-matching photogrammetry … even when there is a lot of low noise. There are many other ways to mix and match the modules of LAStools for more refined workflows. Sometimes declaring all points below the 10th percentile surface as noise may be too agressive. In a future blog post we will look how to combine lascanopy and lasnoise for a more adaptive approach.